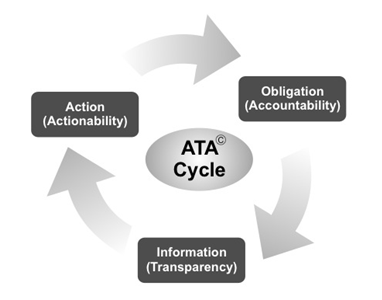 ATA©: The Accountability Transparency Actionability model was created out of the research by Dr. R. S. Murali. This model establishes the linkages between the three elements and provides insights into weaknesses and issues in relation to accountability. This model helps in both conceptualization of policies/processes and their implementation. This model is extremely useful in establishing governance structures both in the Government and Industry. It helps in looking at governance reforms from the perspective of the ‘Demand side of Accountability’. This tool has been discussed in depth in Dr. Murali’s book ‘Demand side of Accountability’.